Last Thursday wasn't technically the hottest day in history although it was record breaking to say the least. Maybe this wasn't the best day to eat such a decedent lunch but it sure felt right at the time. If you're drooling over this delicious looking sandwich, well you should be! This was easily one of the best sandwiches i've ever had ever and i'm dreaming of the day I get to eat it again. Uncle Betty's is a newish old school diner style resto at Yonge and Eglington. My friend Becca also known as Rebecca or RTgDesigns suggested we meet there for lunch, and I was stoked at the idea. Becca is a fellow foodie and blogger and I'm really excited to introduce you to her over the next couple of posts. Becca had a great brunch/resto review blog post and I promise to share it with you soon, but lets get back to business. 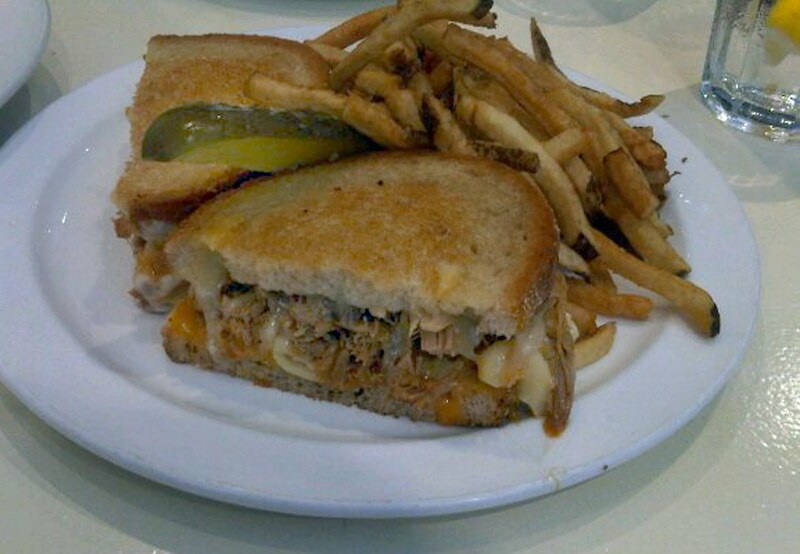 Grilled cheesse sandwich with macaroni and cheese and pulled pork. This is the kinda sandwich that dreams are made of. It can also be ordered with meatloaf instead of the pulled pork but that's just not my bag. I had read about Uncle Betty's before hand so I would know what was good, bad or just not worth it. Becca and I decided we absolutely must try the extreme grilled cheese sandwich with fries obviously. We decided to share it and order a salad as well to balance out all that grease - very logical we are. After some awkward banter back and forth with the waitress our our lunch arrived. It tastes every bit as good as it looks. I had read that the pulled pork was a bit dry and too vinegary but it was perfection to me! I guess the chef had worked out all the kinks because I could not find a single thing wrong with the extreme sandwich or the Greek. The salad had the perfect amount of tartness, good distribution of feta cheese vs lettuce and a nice variety of tomatoes, peppers and black olives. The sandwich was just heavenly. Crispy buttery exterior, creamy cheesy center and slightly sweet juicy pulled pork to finish it off. I told my husband if he ever decided to stop keeping kosher this was the dish to dive into. The french fries were also really good. I should have called it a day after lunch however I couldn't resist a scoop of Gregg's roasted marshmallow ice cream. This ice cream is like no other! It was every bit as good as I imagined. Sweet rich ice cream with strong undertones of camp fire. Right now I'm dreaming of a scoop smack between two soft baked double chocolate cookies. Uncle Betty's actually serves their ice cream sandwiches on fresh made donuts, although I was slightly disappointed to see they were sugar donuts and not glazed. Either way the donuts I brought home for my husband and mother in law where happily gobbled up - even sans ice cream. All in all I would definitely recommend this mid town spot. I don't think it will disappoint.